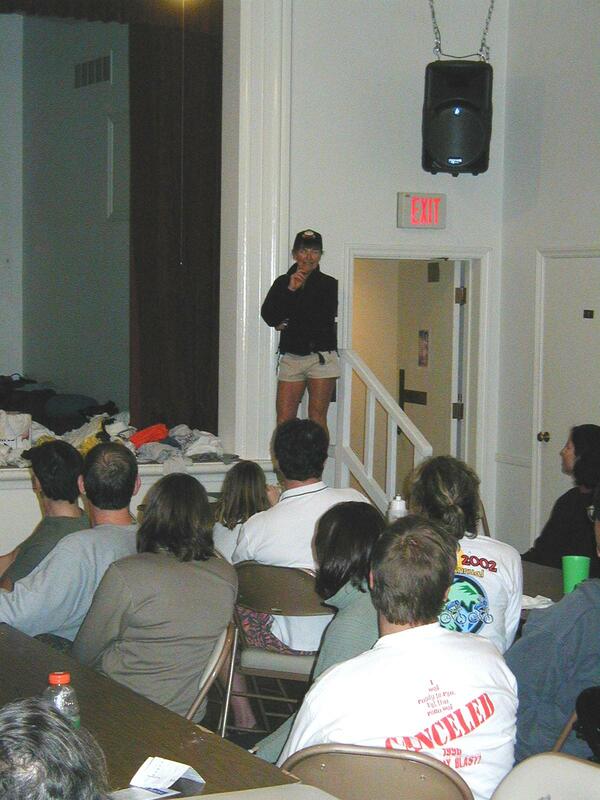 In December 2002, I flew to San Diego to take part in the 46th annual HI-AYH Christmas Trip. 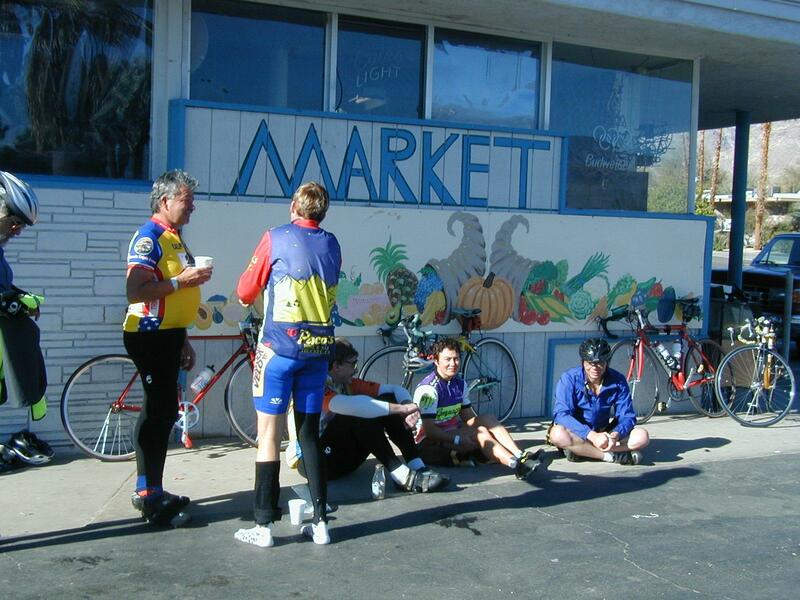 This is an supported ride of six days and 400 miles in the mountains and deserts around San Diego. The group size is limited to 100, so a reasonable sized group, but still smaller than the really big rides such as RAGBRAI or Ride the Rockies. I recommend this ride as a good chance for winter cycling. Beautiful scenery and a few hills are highlights of the trip. On downside, roads in southern CA can be busy. This trip was very well organized. 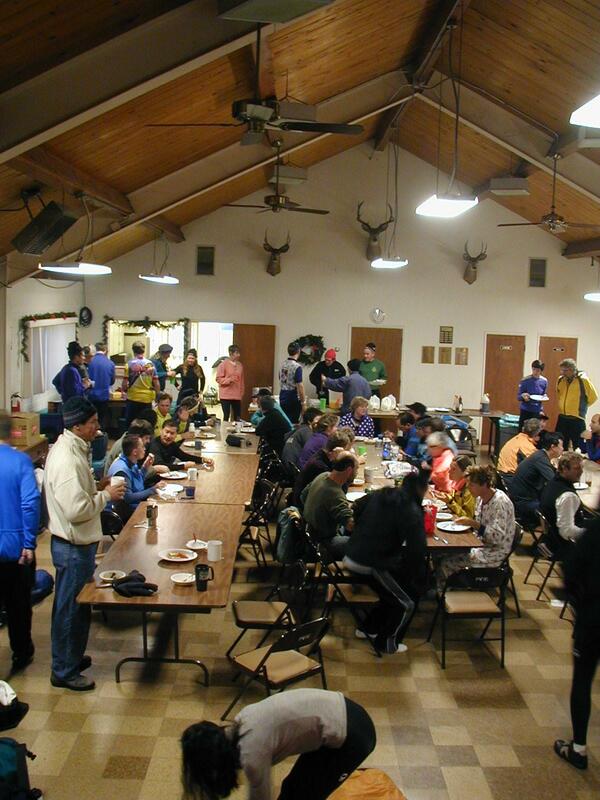 Everyone is expected to pitch in with cooking/cleaning/pickup chores and it is a fun group ride. Baggage is carried in rental truck. 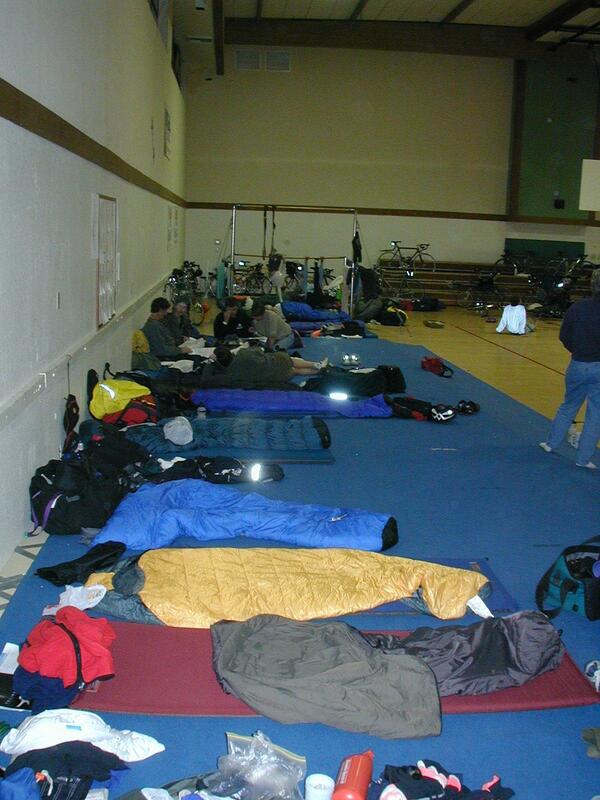 Accomodations are at schools/churches in either indoor halls or in your own tent. 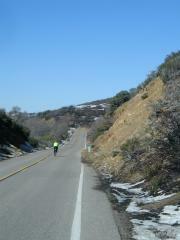 I enjoyed my ride and felt sometimes challenged by hills and met some nice folks. 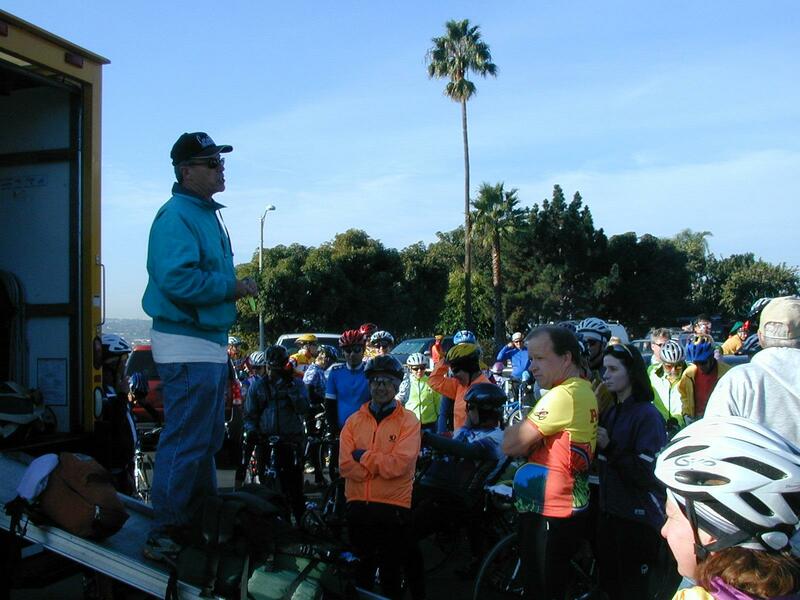 This was my first San Diego Christmas ride, some of these people come each year. A more detailed journal follows. Click on any photo to see full-sized view. Merry Christmas! 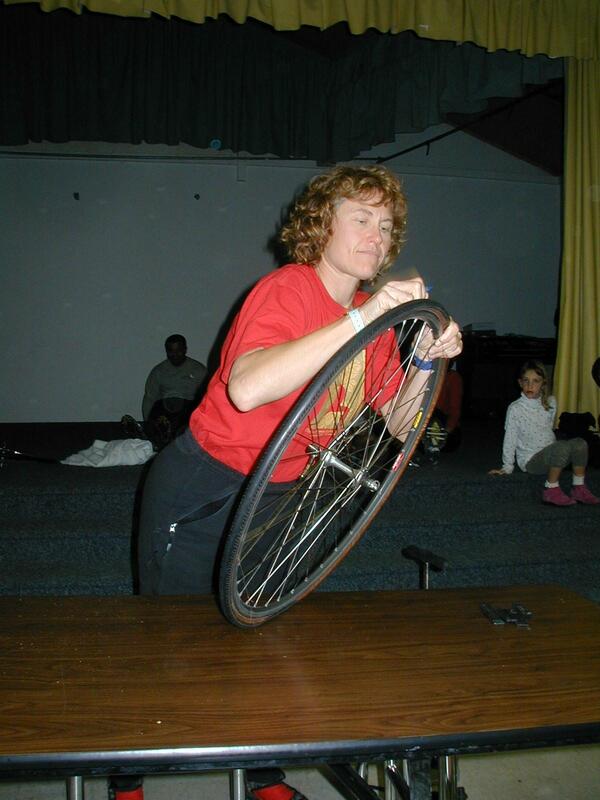 A Christmas departure for a bicycle ride at end of 2002. 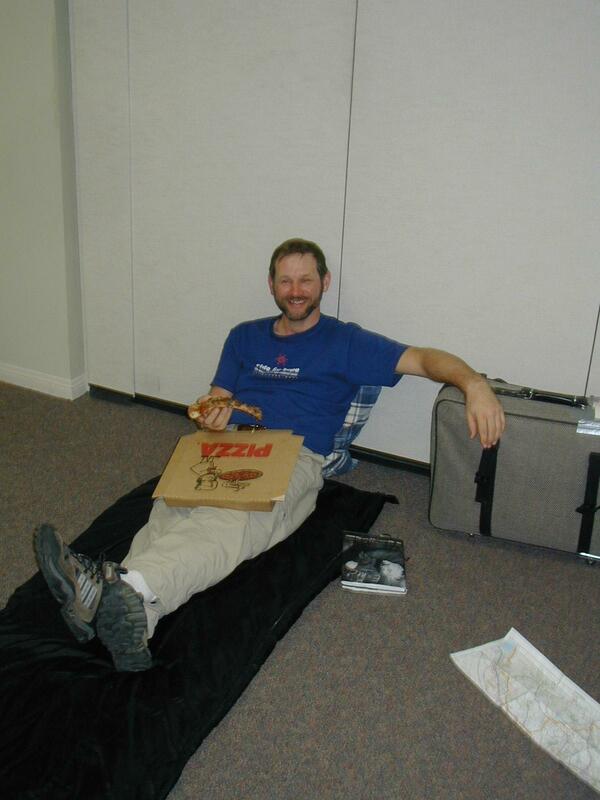 Plan is for a six day ride with Hosteling International, American Youth Hostels (HI-AYH) starting and ending in San Diego. 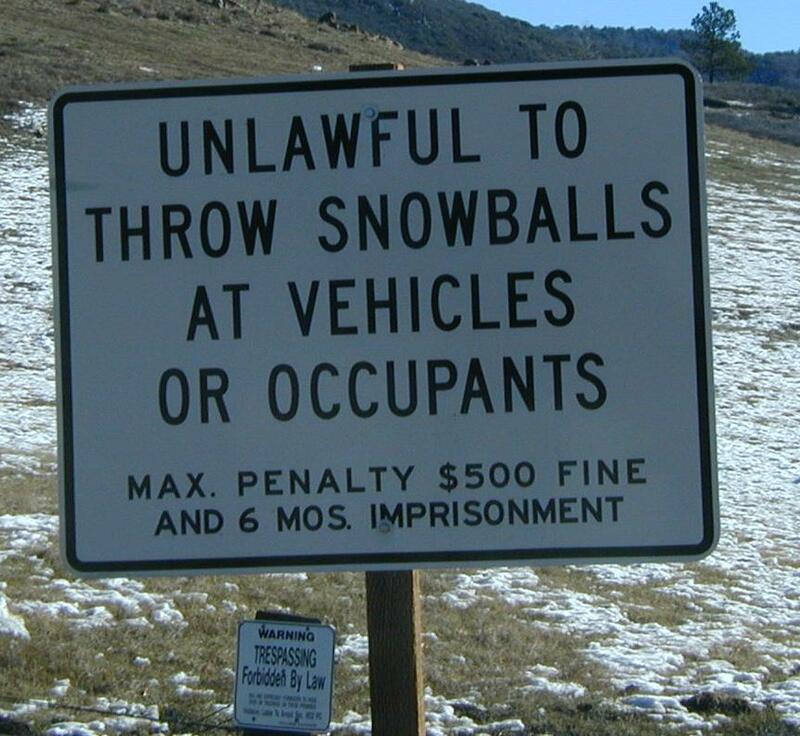 Hopefully a nice winter break. 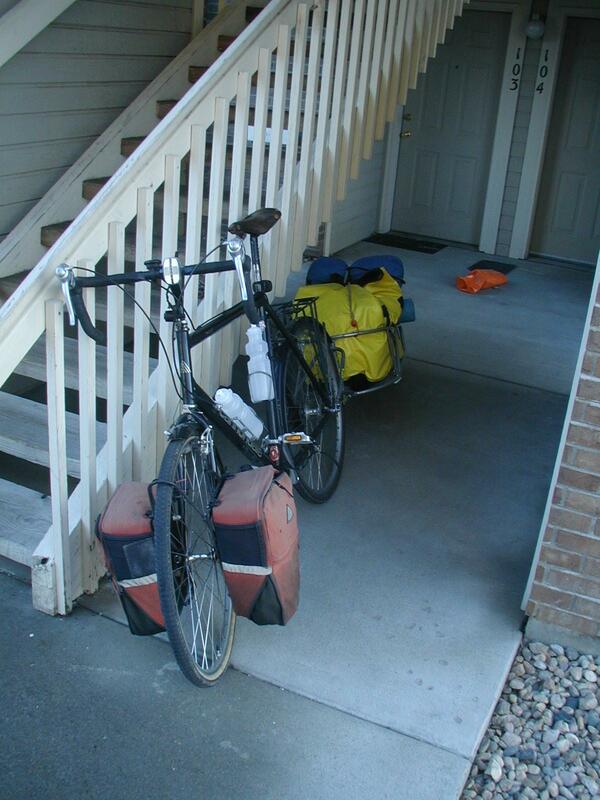 Two days prior, I had loaded my bike trailer and panniers and cycled 50 miles to my parents house. A heavy trailer and temperatures between 15 and 25 degrees kept me moving a bit slowly. On Christmas, after a delicious turkey dinner, my parents dropped me and bicycle off at the airport. On departure, I did the airline shuffle. I thought my flight was 6:10pm on Frontier. Frontier didn't have bike boxes so I walked to United. United offered me a 5:05pm flight at same price. They also told me my original Frontier flight was 5:10pm. Not having to lug the box halfway across the airport and getting frequent flyer miles, made United an easy choice. As a bonus, I was also upgraded to first class. A quick dash and I was happily sitting in a first class seat. The pilot came over the speaker to say they were having problems with thrust reversers and we all had to get onto another plane. Another shuffle and then a 6:30pm departure. Plane landed at my original scheduled time for Frontier flight. Long delay for baggage, but eventually assembled the bike and rode along the bike path to downtown San Diego. A peaceful calm Christmas night. A few people walking the path, a few homeless, but otherwise calm. Without too much trouble found the hostel. Hostel desk was closed, "due to the holiday". No obvious way to summons anyone. I waited for a while, but eventually timed out and went to nearby motel. Lots of climbing today, 6100ft on the route and some more before I started. Left at 6:15 an slowly navigated my way through downtown San Diego and up a long gentle grade on 5th Avenue. 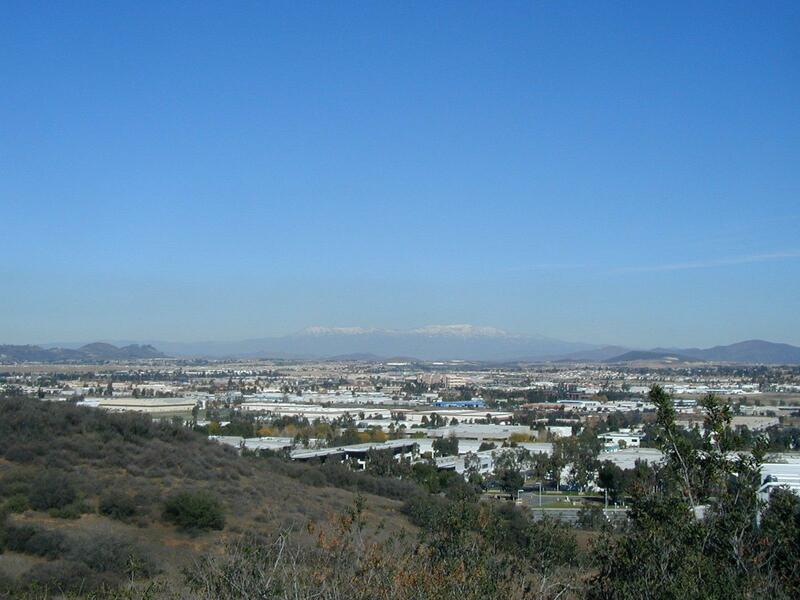 At top was Washington Avenue, a hospital and steep descent to San Diego River. I followed the frontage road along I-8, but crossed over one road too soon. Sexton Park was ok, but after that dirt path, debris, abandoned shopping cards before the path finally petered out. I carried my bike and gradually found my way uphill to the main road. A brief breakfast stop and then I could start the trip for certain. An informal checking: gave my release, picked up a t-shirt and route maps. Repacked my paniers in a duffel and dropped it off at the luggage truck. Don the tour leader whistled, gave some instructions and then with a clicking of pedals, we were off, 85 strong! 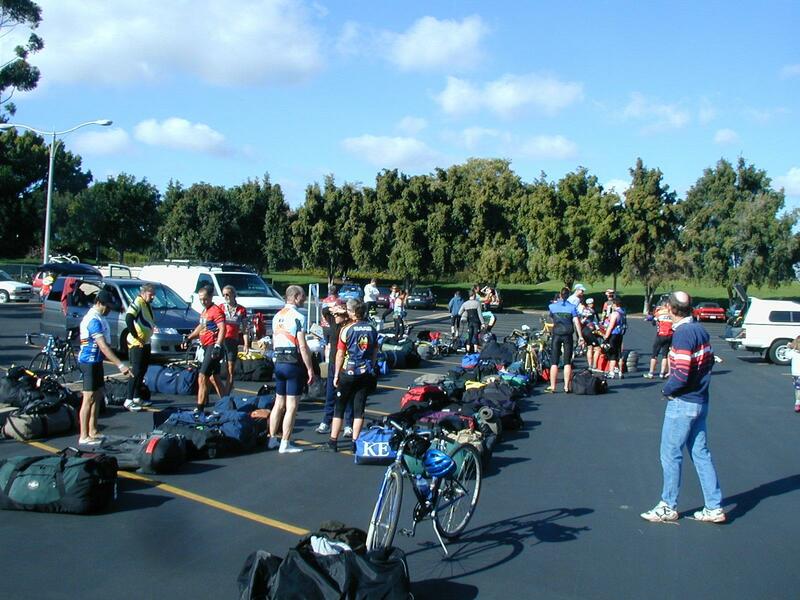 The big clump of cyclists quickly spread into smaller groups according to speed. At 2.25 our group made first deviation from "official" route. I was following some from San Diego, so decided to follow them rather than instructions. Busy roads, but mostly flat with good shoulders as we followed the San Diego River valley and I-8. At 11 miles a left turn onto a park at Father Junipero Sierra Trail. Uh, oh! Cyclist down! As I passed, a small group of cyclists was huddled around a male cyclist, keeping his neck immobolised and treating a head injury. Later rumors confirmed a broken cheekbone, broken hand and hopefully not worse. Yikes! Ralph who fell was typically entertainment director and was missed by many regulars. After Father Junipero Serra Trail some gentle rises. I was riding with small group, though they started going quicker, so I was mostly alone. I didn't stop much, so sometimes played leapfrog with others. At mile 25 the climb started for real. I'm usually slow on hills (up and down), and this was no different. At mile 33 a town of Alpine (2000ft) and brief stop. At mile 39 frontage road ends (2800ft) and three miles of I-8 (3400 ft). Nice folks on a tandem told me at Alpine that this was just start of the toughest parts, though could expect things easier after the first two days. 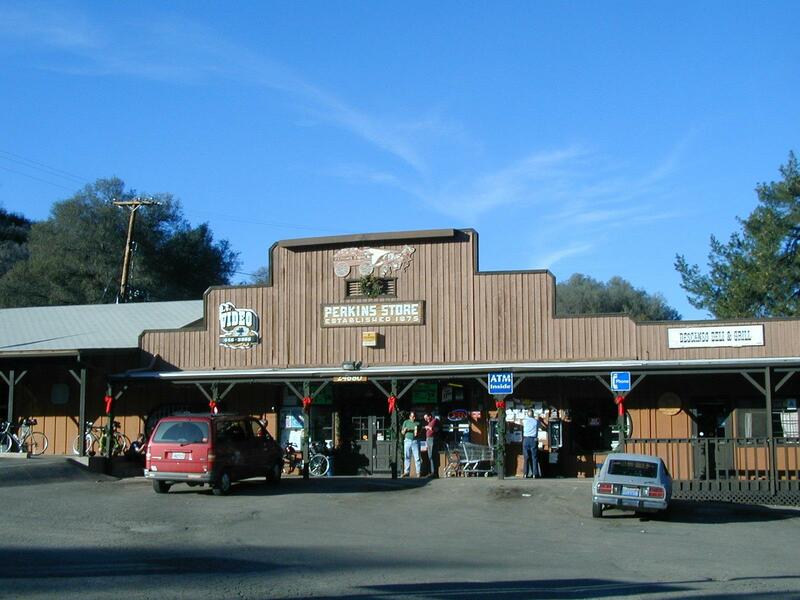 Left I-8 at mile 42 and brief ride through small town of Descanso. After that last climb of the day (4100ft) and descent to Pine Valley community church. It was after 4pm and 2/3 of the group had arrived. There was signin to keep track and later sweep with SAG van. Tight quarters but I found a place for my sleeping bag and relaxed. 57 miles today with 6100ft+ of climb. Spectacular scenery today. 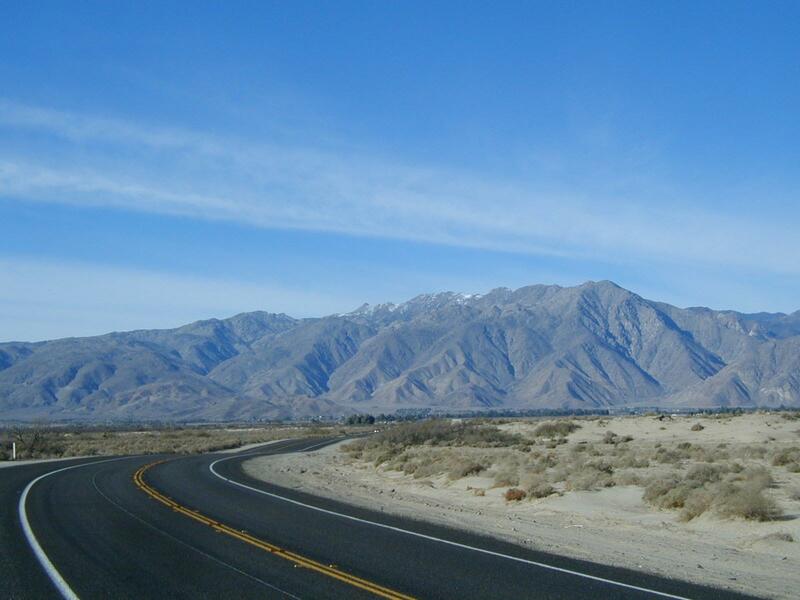 We cycled up and over the Sunrise Highway with excellent views of both deserts and mountains. The group was a bit slow getting started. Temperatures near freezing and an announced departure time of 9am. Approximately 40% of people were camped in tents outside. The rest of us were inside the Pine Valley Church. Last night was "hot seat" where people did introductions. Most were from San Diego, but also good sized groups from Seattle, San Francisco Bay Area and Los Angeles. A few more states represented with at least NJ, NY, WI, CO, IL and MT. For about half this was the first Christmas HI-AYH ride, but there were also some who had been on four, five, eight, ten or more of these annual rides. My guess is average age in the 30s or 40s with some 50s, 20s and a few 60s. A lot seemed to fit profile of club riders. Only one recumbant and about a dozen tandems. The youngest rider was seven. The oldest seventy. 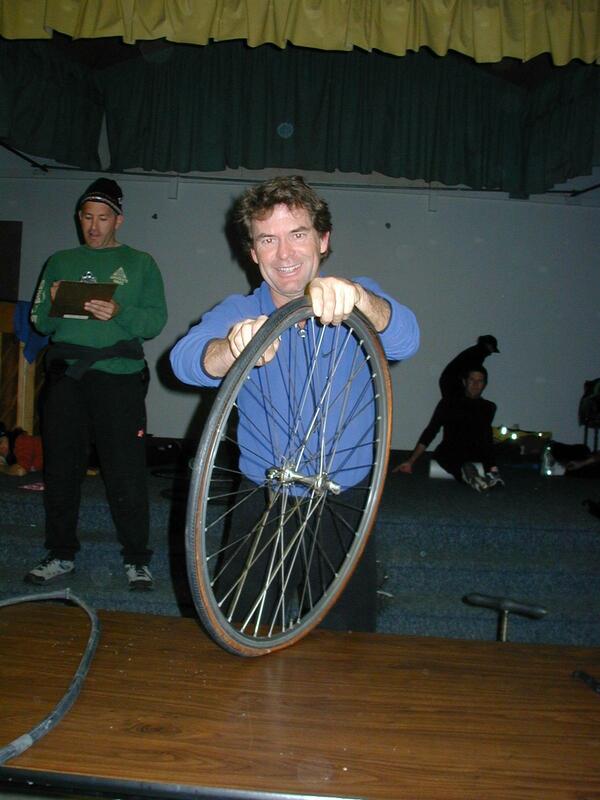 The SAG driver, Marty, introduced himself with a "I'm working on my first century... I have about 30 years to go..."
I helped fold tables, load the truck and then decided to leave at 8:20am before the official start. The first nine miles were a slow gradual climb from 3700ft to 6100ft. Snow level was a little less than 5000ft. Many families with kids were parked along the way with sleds. I was slow to climb and people kept passing me. 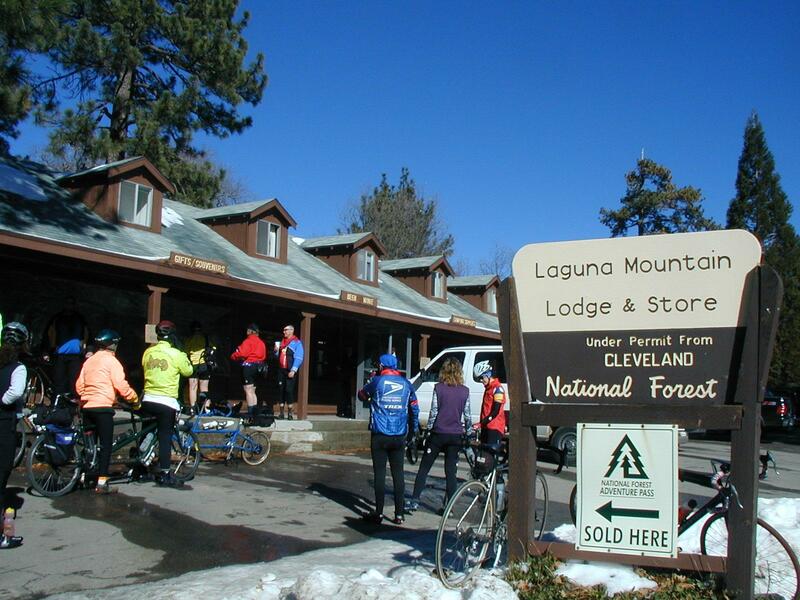 However was happy to see the top a little before 11am and then descend to Laguna Store at mile 11. This next part of Sunrise Highway was spectacular, with many views and vistas. More downhill than up, but still a few climbs. A few spots had ice on the road, so careful cycling. 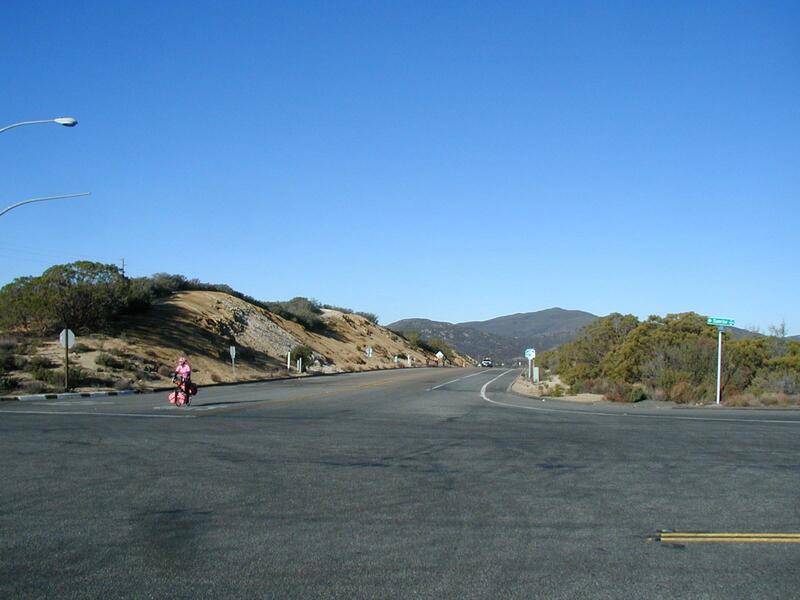 At mile 25 came to end of Sunrise Highway and followed highway 78 another six miles into Julian and chance for lunch. Hooray, nice to get some food. 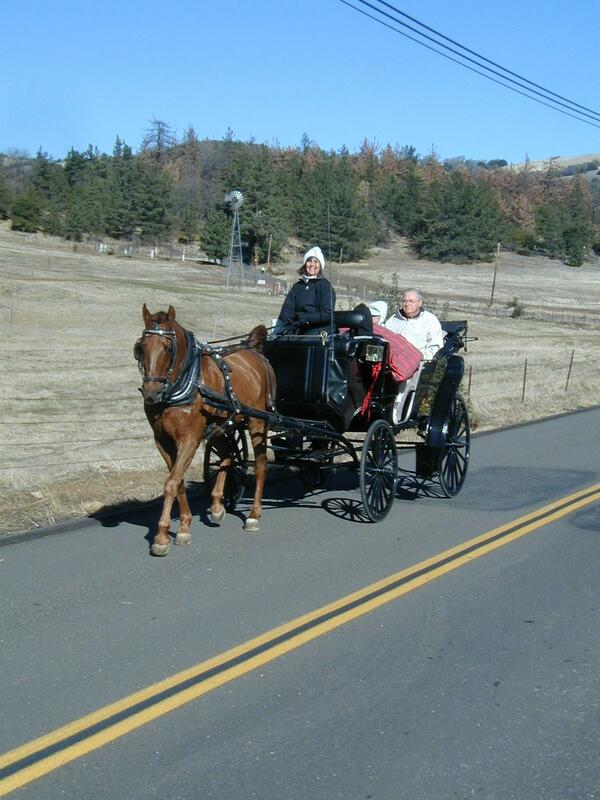 Julian was a quaint little tourist town with horse drawn carriage rides, souvenirs and apple pies. From Julian, followed backroads for 5.5 miles and then on 78 through San Ysabel at mile 40. This next stretch had some long gentle grades, lots of traffic and little to no shoulders. In the open areas a strong cross-wind started to pick up. 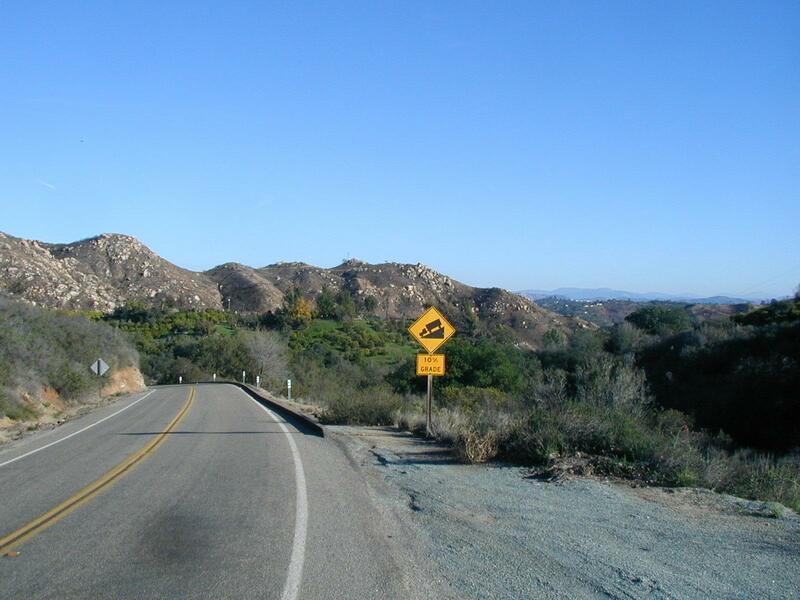 I was happy to cross the last hill and get into Warner Springs. We're staying at the school. Good showers with plenty of hot water here. 53 miles today. 2837ft of climb and 3542ft of descent. A long ride today with an excellent descent and nice desert scenery. Today was a long day, scheduled for 98 miles, with an alternate scenic route of 67 miles. Last night evening activities included a tire changing contest (fastest time 70 seconds), and unfortunately today saw many people stopped with flat tires due to debris on the road. I was on the road by 7:05am. Felt a little guilty for not helping to load the truck or cleanup. However, also realized that I needed all the daylight hours I could get. It was a peaceful calm ride. A few desert rats out with their motorhomes, dune buggies and motorcycles but not much else on the road. First 13.5 miles were a gradual climb of 1350ft up through Ranchita. Nobody came past me in this part. 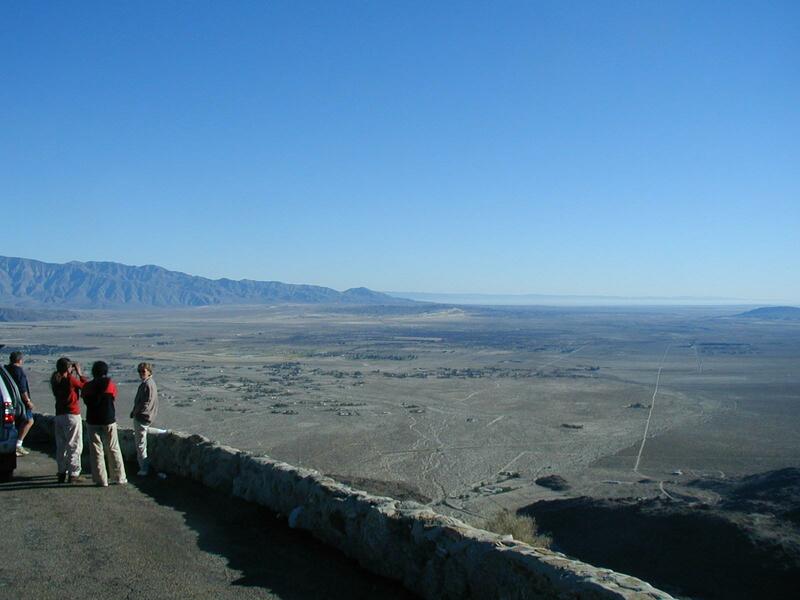 From here a spectacular view to desert beyond and a 3600ft drop marked with 6-8% grades. I really enjoy these wide sweeping views of desert valleys. I went slow enough that my rear rim became very hot. I kept going slow and many of the other cyclist passed. One motorist in a tan bronco paused long enough to yell obscenities. I felt sorry for him since he was going to pass a lot more cyclists, so he might as well calm his frustration. At bottom of the hill was Borrego Springs at 26 miles. Much of the group was stopped here. From here, 27.5 miles across mostly flat desert to the Salton Sea at 180ft below sea level. Many desert rats out here parked with their RVs in clusters. Mostly good riding with last 10 miles of gradual descent so almost no pedaling. At Salton City, stopped for a burger and then started north on 86. This was four lane freeway with wide shoulders and high speed traffic. Reasonably fast but not too pleasant. At least it was calm winds. About mile 70 the road split between 86S and 86. Route sheet called for no turns so I kept going on 86S. At mile 78 discovered I'd taken the wrong road, adding another five miles. At least I turned off busy freeway and into quieter roads past orchards and vineyards. Variable roads, some quite cracked. Slow rode last few miles to Palm Desert. 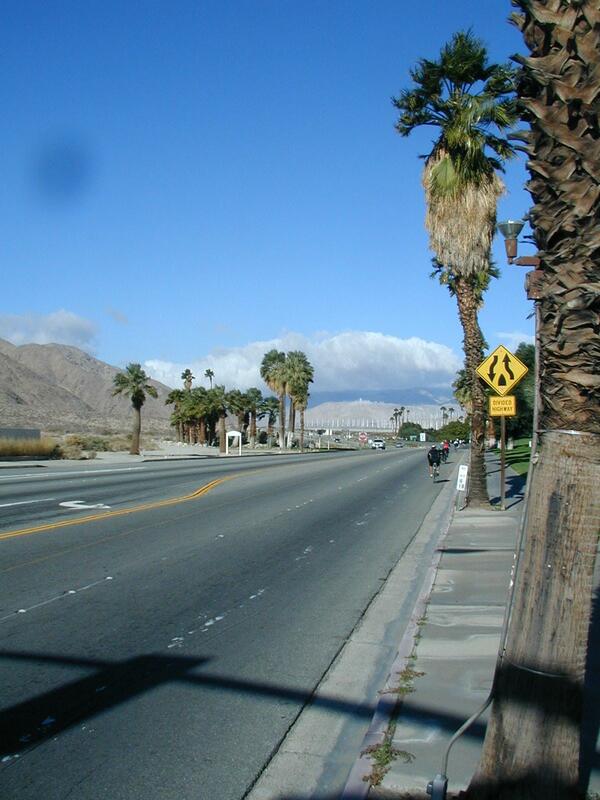 City of Palm Desert has many new housing developments, lush golf courses and vacation homes. Wide streets with a lot of traffic. Made it in just before dark. 103 miles today. At least 20 people took the alternate route and a some were sagged in because it was too far. Most of the others I think I saw on the road today, being first out and one of the later non-sag into Palm Desert. In evening, I helped scrub pots. It is a trip with shared chores and reasonable cost ($300). Today was a tougher ride than the route sheet would lead you to believe. Only 60 miles and 2650ft of climb. We loaded truck at 8:00am and I was off by 8:30pm. 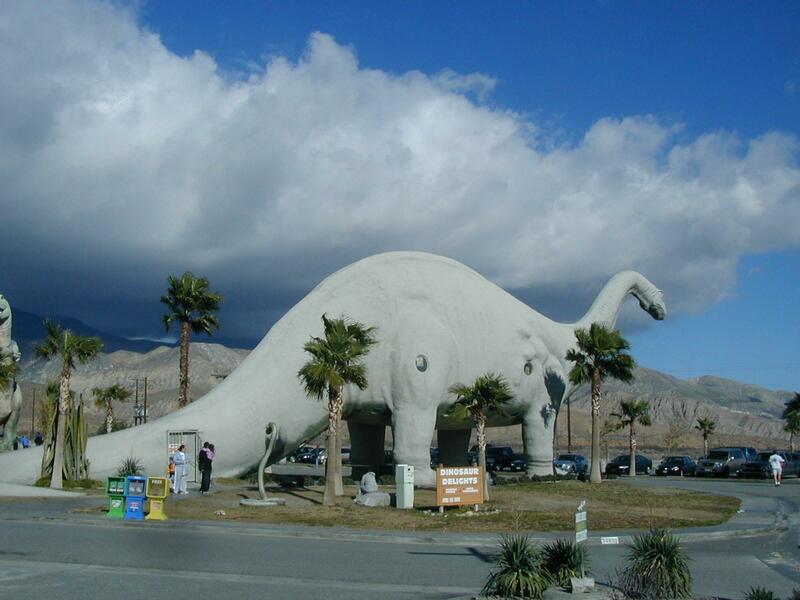 The first 16 miles were through urban areas of Palm Desert, Cathedral City and Palm Springs. These cities are recent and look a bit artificial. For example, the River shopping center had a large pool in middle of the desert. Road had two lanes each way, mostly smooth pavement and reasonable shoulders. At mile 17 the wind hit. This area has many large wind turbines and most were generating power. It was a very slow slog upwind and slightly uphill. I walked once or twice and one wind gust was strong enough to stop me (apparently a few of the lighter cyclists were blown over). I stopped several times, but slowly made it 9.5 miles to I-10. The SAG truck was parked here with several people waiting. I paused briefly and continued. From I-10 it was another 6 miles of interstate and frontage road. The wind became slightly less, but the hills was steeper. It was about 1 pm when stopped at mile 31 in Cabezon. Ready for quick meal at Burger King. 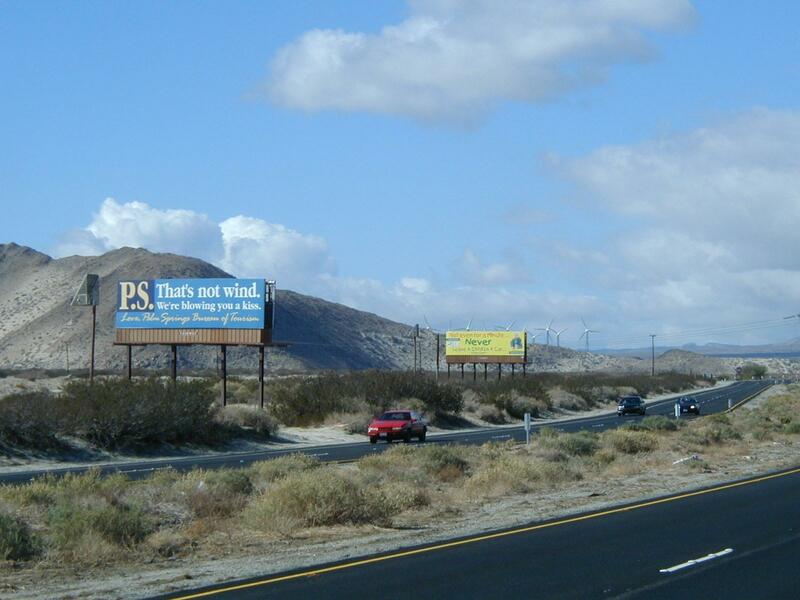 The next stretch went past Morongo Indian Reservation with several casinos and many outlet stores. Also a lot of traffic. The wind was less, though I was too tired to notice much. A slow slog to mile 45 and town of Beaumont. Downhill! No wind! Yeah! It was good to turn north on 79 and lose 1000ft in descent to the valley floor. A nice mixture of clouds and late afternoon sun. Also a good descent. Slowly made my way last bit through rough roads and into town of Hemet. Washed pots again tonight. 60 miles today including almost half strongly upwind. An easy scenic ride today. Storm front passed through yesterday so beautiful clear weather today. Flat farmland in the first half and hilly scenic rural road in second half. Last night they played some video tapes from previous rides. This is the 46th annual ride. Interesting to see change in helmets and styles from 20 years ago. The groups were smaller, but also seemed to be more college age riders. Today I stayed for a 9am group start. The whole crowd rolled past the camera to make video for this year. Soon we rolled out of town and via farmland to south and west. Stopped briefly to help someone with a flat. 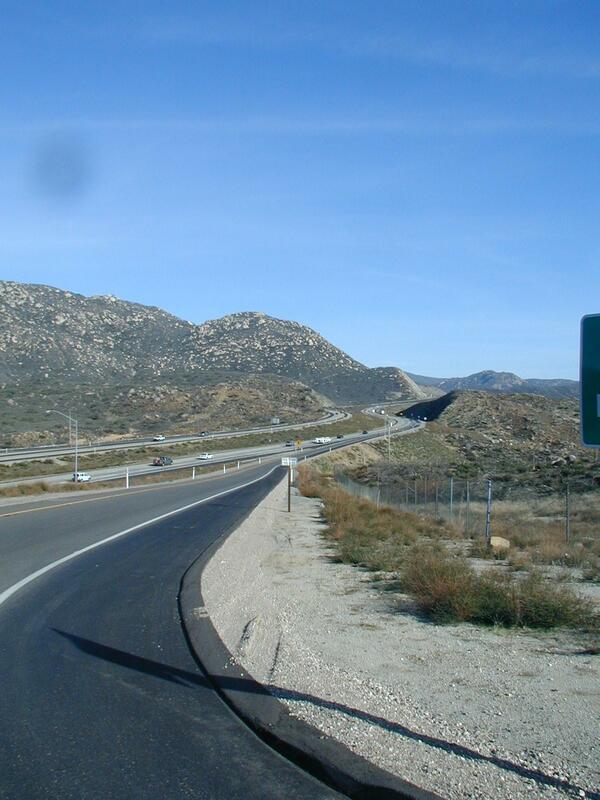 Rode out to I-215 and followed it for six miles and then down through Murietta and Temecula. Here a Del Taco lunch. After lunch the terrain quickly changed. First a slow 500ft climb up and over a fault scarp. I could see back for most of the route I'd already riden. A little riding along the ridge and then winding down, along, over and through many small hills. This winding road was surrounded by avocado trees, vineyards, fancy houses, trees, non-fancy houses, horses and other rural scenery. Several creek crossings over the road, a few of them wet. Most of the road was either up or down, with very little flat. It was sometimes slow climbing, even walked once or twice. At 55 miles came into Fallbrook and found my way to the church we were staying for the evening. A nice, scenic and easy ride today. A pretty ride along the coast back to San Diego. Also an easy and quick ride. Last night was awards ceremony. Everyone was asked to bring a t-shirt for a prize. Nominations were taken from the floor. A set of nominations in appreciation of work done by Don the organizer, Marty the SAG driver, the food committee, registration, etc. These were well deserved as the trip was well run. A set of appreciation type awards and just a set of fun awards. This morning, I took off an hour before scheduled departure. First six miles were mostly downhill to a highway 76. Busy roads, but also a reasonable shoulder. I followed the valley to mile 15 and then briefly got off course following some confusing instructions. 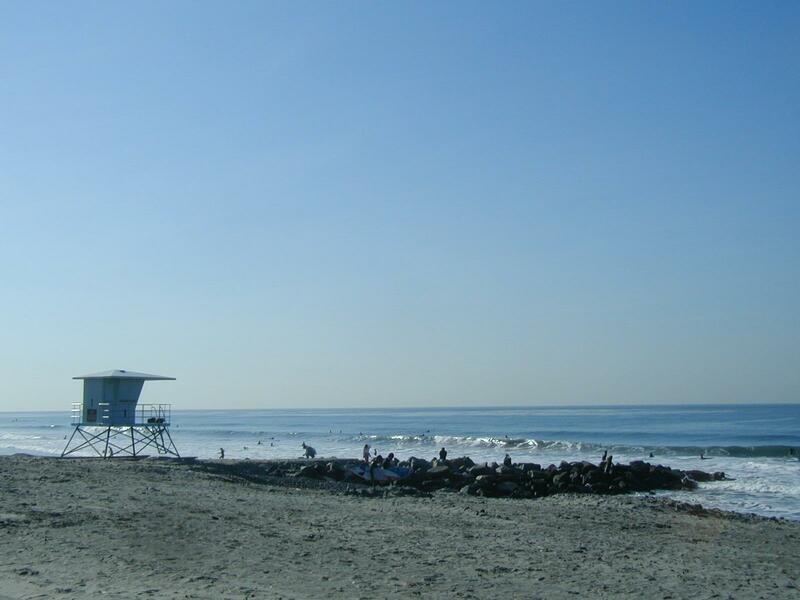 Came up and over several large hills and to the Pacific Highway in Oceanside. Many cyclists out on the road today. A fairly busy road that came past several beaches, town centers and shops. It was fairly flat and so quick riding. At mile 41 was largest hill of the day, 490ft up Torrey Pines Hill. Also here the route changed more urban with mixture of frontage roads, bike trail and smaller streets through La Jolla and then up the last hill to UCSD. Got in right at 2pm after an easy ride. Picked up my stuff and rode my bike to close to a little past the airport. End of a nice ride and now a train trip back. 58 miles today. Slept through the new year in a hotel close to the airport. The next morning I cycled the last mile to train station. 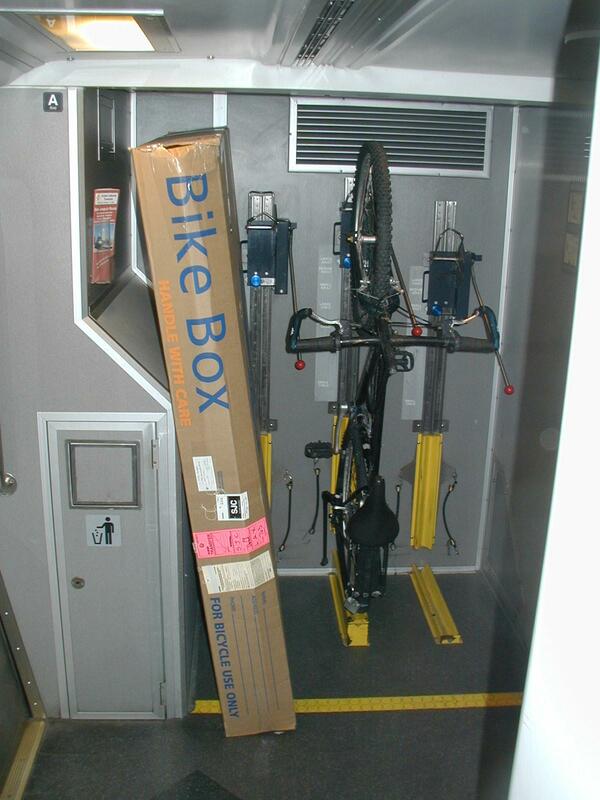 Disassembled the bike, paid $15 for transport and box and checked it onto the 6:12am train up the Pacific Coast. 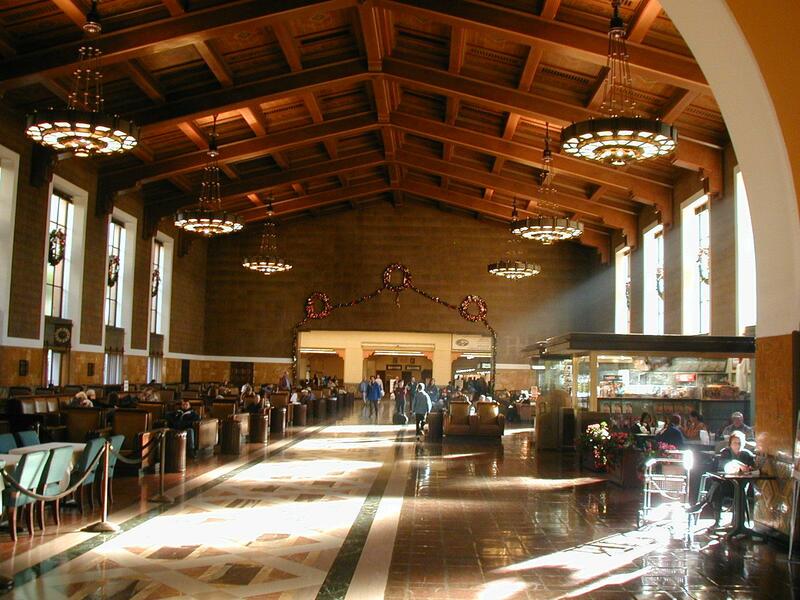 Amtrak is a slower but more pleasant way to return. The stretch along the CA coast is particularly beautiful. 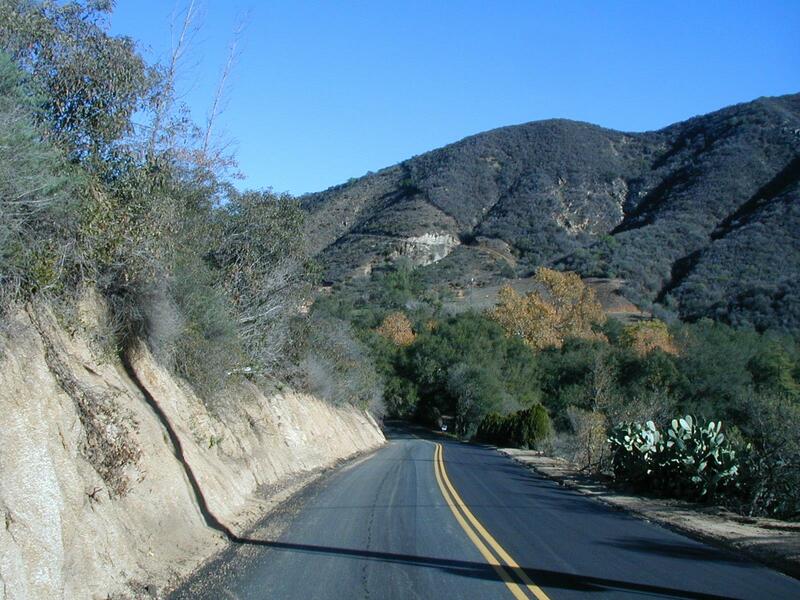 Enjoyed stretches from Santa Barbara to SLO as I hadn't seen them before. Had some good conversations including with Sherry from St Louis who was seeing America with a 30 day rail pass... Got into San Jose at end of a long day, found a motel close to train station. On January 2nd and 3rd, I took the next 34 hour train ride from San Jose across the Sierras and Rockies back to Denver. Nice relaxing and beautiful to see the countryside pass along the way. My parents picked me back up from the train. On January 4th, cycled 50 miles back from Westminster, CO to Fort Collins. My parents brought my gear so it was quick riding with relatively flat terrain and no weight to carry. End to an enjoyable cycle trip and some early practice for my next cycle journey (two weeks from today, stay tuned).